A special discount offer for Tinderbox (and or Twig) for customers of Scrivener spurred a discussion about the usability of Tinderbox at the Literature & Latte Forum. A few Scrivenites who’d taken advantage of a similar previous offer were complaining that Tinderbox was too difficult to use and had given up on the software, saying it was a waste of money. The Day Planner for Tinderbox (click for larger view). If you’d like a copy of this Tinderbox document, send me an e-mail (szeoli–at–earthlink–dot–net). My frustration with Tinderbox isn’t so much with the app as it is with trying to imagine “best practices” for using the software to solve problems. For instance, Tinderbox has tremendous potential for mapping out sophisticated workflows. I currently use it for my own personal kanban system. I know that there is so much more I could be doing with it but I just can’t seem to bridge the gap between what I currently know about the software and what I don’t yet know. For what it’s worth, I’ve always had the same problem with Applescript and Automator. I know that I could be using these tools to get more done, but I’m not sure HOW to use the tools to full advantage. Yes, Tinderbox has a lot of user submitted stuff on the wiki and forums but it’s not always that easy to follow. I have to say that I agree with everything you have to say. I guess that my approach to Tinderbox is to do with it what I can, while gradually expanding my understanding of it. Slow process, but also fun and rewarding. But I love discussing and writing about these kinds of things, so maybe my infatuation with Tinderbox is partly due to the fact that it provides an endless topic to explore. 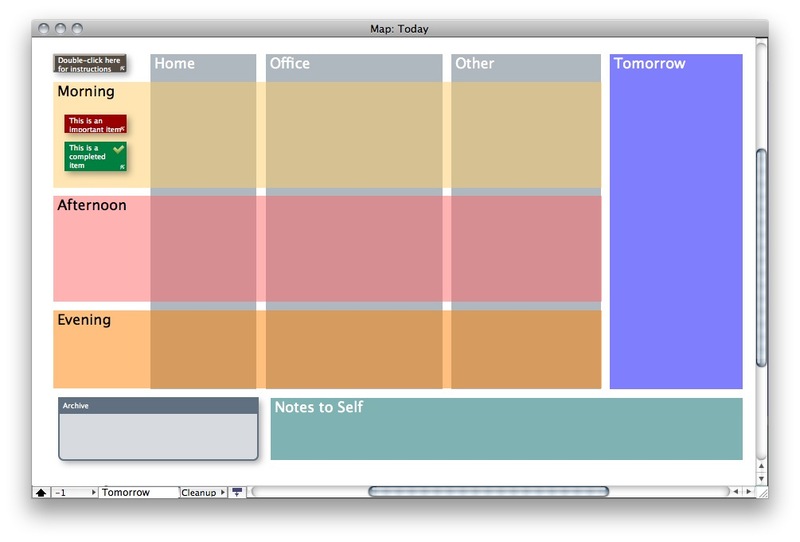 Steve, I know this blog entry is old, but do you still use Tinderbox as your day planner? I have tried again and again to implement it into my workflow but somehow it just doesn’t click… Due to my own limitations of thinking and lack of commitment, I guess.. I doubt the problem is your limitation or lack of commitment. Tinderbox can be challenging. Also, my “day planner” document is not necessarily the best way to implement day planning in Tinderbox. I was just trying to demonstrate how you could use Tinderbox with a minimum use of its more sophisticated features. To answer your question, no I don’t use Tinderbox as my day planner. I think I would if I used a Mac at my office, but we’re using PCs. I have been using Tinderbox to keep date-specific notes, what I call my day book. And these notes are just my personal notes, not work related.